Time: 1 hrs. 15 mins. Trailhead: 2421 E. Northern Ave. The Dreamy Draw Nature Trail is located in the Dreamy Draw Recreation Area of the Phoenix Mountain Preserve in Phoenix, Arizona. The metamorphic type of granite geology that is common in the area coupled with a thriving desert flora makes Dreamy Draw popular with hikers and trail runners seeking exercise and their own communion with nature. 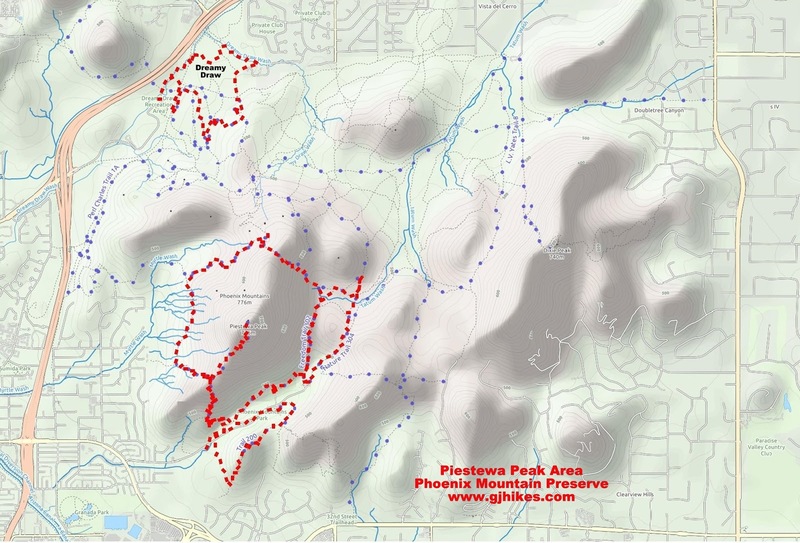 The trailhead is located at the far northern end of the Dreamy Draw Recreation Area near the Piestewa Freeway. The gated parking areas and trailheads are open from 5am to 7pm and the trails themselves are open until 11pm. The Dreamy Draw area has numerous trails that pass through the area from elsewhere and others that meander around various hills and washes. In this picture the main trail is the branch on the right. For this post though we are following the left fork. The thick growth around the secluded wash looked like a good place to explore. We could have found a way around this large culvert but chose otherwise. After stepping into the culverts shadow we turned the cameras flash on to illuminate the path and see if any critters might be present. Several well worn side trails in the area present even more options in choosing a route. The wash has its own allure that beckons investigation. There were plenty of tracks from other hikers so we decided to try it ourselves. There are only a few good places to climb out of the wash. We hiked all the way to the end of it and took the spur trail coming out of the local neighborhood to get back onto the main trail. Here comes a trail runner working on his tan. Trail running is an addictive sport that is very rewarding. The constant flexing of the knees and ankles as they respond to the uneven terrain helps runners avoid the repetitive motion injuries that come from running on streets and tracks. The key, of course, is not to stub your toe and do a face plant. It is easy to see how Dreamy Draw got its name. The Dreamy Draw trail has two short connector trails that link it to the Perl Charles Memorial trail plus a connector to the Charles M. Christiansen Memorial trail. Dreamy Draw and the surrounding trails provide hikers, trail runners and mountain bikers with a little more seclusion than the busier trails like Piestewa Peak and others. With the typical flora and fauna that visitors expect to find in the Sonoran Desert the Dreamy Draw is there to be explored. If you would like to see it for yourself then all you have to do is 'Take a hike'.